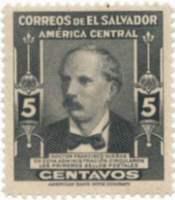 The first stamps of El Salvador were printed by The American Bank Note Co. of New York, or as it says in the bottom of the sheets (in Spanish) Compañía Americana de Billetes de Banco de Nueva York. 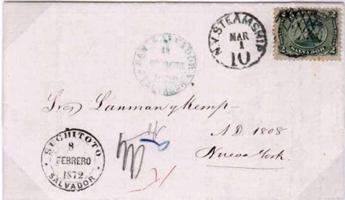 Printed in September of 1866, they arrived to El Salvador on December 17th. They were officially issued on January 17, 1867, but their use was not mandatory until March 1st. The set consists of 4 values: ½ Real (blue), 1 Real (red), 2 Reales (green) and 4 Reales (bistre), issued in sheets of 100. They feature an active volcano with 11 stars making a semi-circle above the volcano; each star represents a Salvadorian province in those years: San Salvador, La Libertad, Sonsonate, Santa Ana, La Paz, Cuscatlan, Usulutan, San Vicente, San Miguel, La Union and Chalatenango. There are two printings of this issue, the one in September 1866 already mentioned, and another in April 1873. The printings can be distinguished by the different color shades for each printing, and by the heavy yellow gum used on the first printing, which differs from the thin white gum used for the latter. During that time, the President of the Republic was Francisco Dueñas and the currency was the Real. Traditionally, the volcano on the central oval has been considered to be the San Miguel volcano. 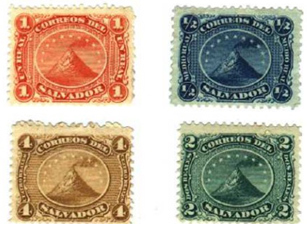 However, since the design is an allegorical representation of the coat of arms existing at the time, the stamps really depict not the San Miguel, but the Izalco volcano (popularly known as El Faro del Pacífico - ‘The Lighthouse of the Pacific’). This argument is based on the fact that the decree creating the coat of arms specifically mentions the Izalco volcano as the inspiration for its design, and also on the idea that the Izalco volcano was (and still is) one of the symbols of the country. Covers genuinely used with these stamps are very rare.